Shop cross necklaces for men and women. 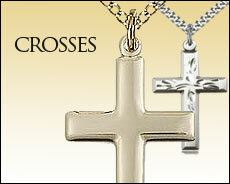 Our crosses are crafted from 925 sterling silver, 14K gold filled or 14KT gold in the USA. Each comes with a Limited Lifetime Guarantee against damage and wear. The sterling and gold filled pendants arrive with a stainless steel curb chain nicely packaged in a velvet box ready for gifting. Men's cross necklaces feature 24" chains and the smaller ones come hung on more feminine 18" chain. Browse crosses by material or cross style.